Hi my gardening people. Well a lot has happened since my last entry. Spring has arrived!!! I am so happy, my hydrangeas are coming back from last years weed and feed debacle. I only lost one. They are small but fight to come back none the less. My perennials from last year are growing and I will be going this week to get flowers for the deck. I love this time of year I am filled with such hope. My azaleas and loropetalums are doing well and I can't wait to follow them on their journey into full splendor. I am having a problem with weeds and dichondra in particular, but I am weed and feeding (just the lawn) once a month and hopefully this will help. Now for my big news. First off we are having some Drainage problems or more precicly erosion problems, behind the deck. It doesn't rain much here but when it does the soil follows the water. This is all due to the construction of the deck and shed, and also the removal of all the vegetation behind the deck. I am planning a two fold attack. #1 a french drain and dry creek bed in parts. to stop the erosion with rocks and move the water away under ground. 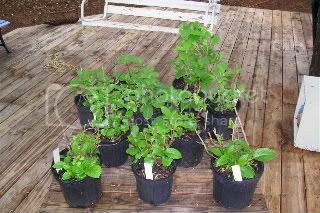 #2 I just made a trip to a semi local (Atlanta Metro) hydrangea farm and bought 10 new beauties. I was so happy to find a grower within driving distance. I will definatley be going back to add to my collection. I will plant them along the back fence line then fill in with perennial shade plants/flowers. As you can see my Hydrangeas are small but they will grow fast and help to stop erosion. I am just head over heals for hydrangeas and while "endless Summer" is pretty, I want a variety of different kinds in my woodland paradise. No two are the same. I am planning on getting name plates made for each one. I plan on laying 2 foot round pavers along the back so one can stroll along and enjoy the beauty of nature. I'm rambling now so I will sum this little blog entry up. Yeah SPRING!!! Oooooh, those are going to be so pretty when they all bloom. Don't forget that we really do need to see photos of them then.